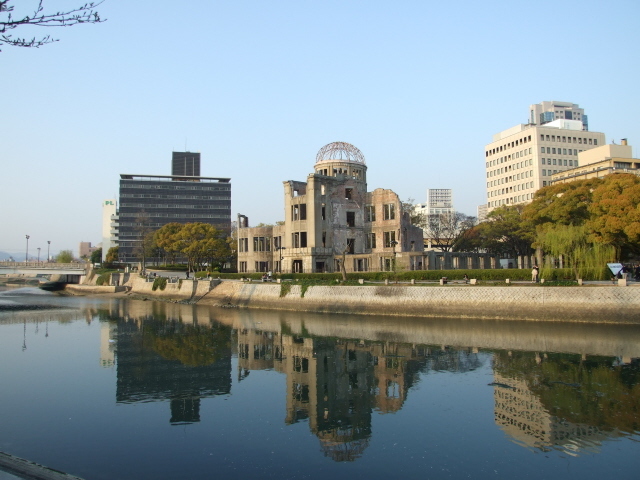 The ruins of the former "Hiroshima Prefectural Industrial Promotion Hall", gutted by the atomic bomb – ever since it has been THE landmark of Hiroshima, and one of the most iconic, most instantly recognizable structures in the world. For dark tourism it's something like the Eiffel Tower. 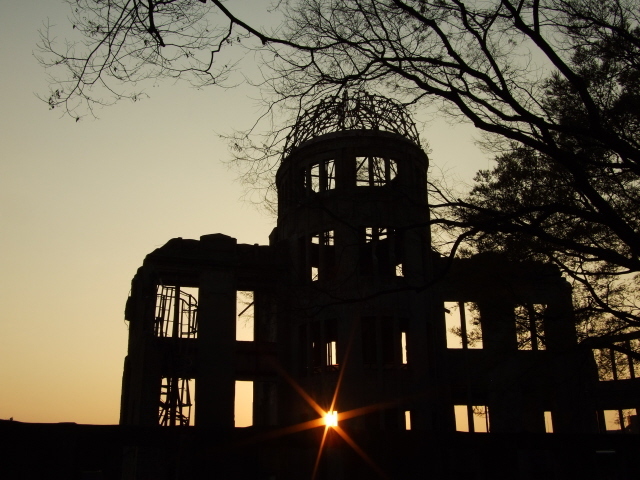 At the same time the site is a powerful symbol of Hiroshima's self-declared contemporary role as a "Mecca for peace". 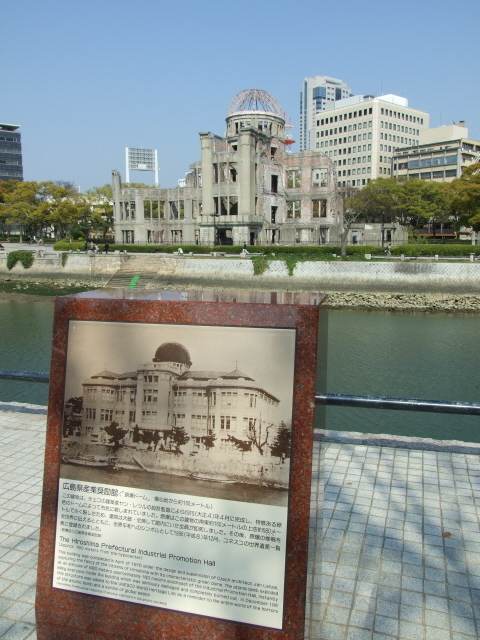 More background info: The Dome's original purpose was rather "profane" in comparison … it was the central part of a large 1915 building: the "Hiroshima Prefectural Industrial Promotion Hall", where trade fairs and exhibitions were held. It was designed by Czech architect Jan Letzel in Secession style, and was one of the most solid edifices around. During WWII its original purpose grew almost to a halt and the building housed offices of the Ministry of the Interior. The hypocentre of the atomic bomb that was dropped on Hiroshima at 8:15 a.m. on 6 August 1945 was a mere 175 yards (150m) away. However, that also meant that the blast came mostly from directly above since the bomb detonated 2000 feet (600m) above ground. Thus parts of the solid wall structures remained standing, even though the entire interior, the roofs and all floors were completely destroyed – and everybody inside lost their lives in an instant. Most of the walls at the back of the building collapsed but the central tower-like structure with its dome remained an empty shell, albeit a more or less complete one. 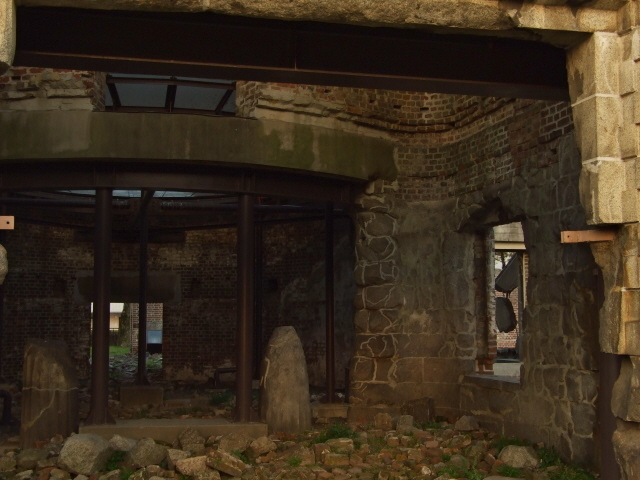 Because of the shape of the iron girder dome at the top, the ruins soon acquired the popular epithet "Genbaku Dome" – A-Bomb Dome. After the war it was eventually decided (after some initial controversy) to preserve the A-Bomb Dome for posterity as a reminder of the horrors of the bombing. Comprehensive restoration work was necessary on two occasions – in 1967 and in 1989/90. 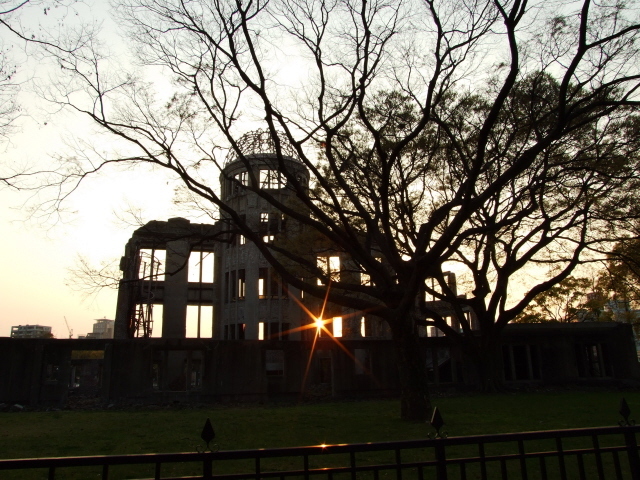 In 1996 the A-Bomb Dome was registered as a UNESCO World Heritage Site (despite protests by the USA). 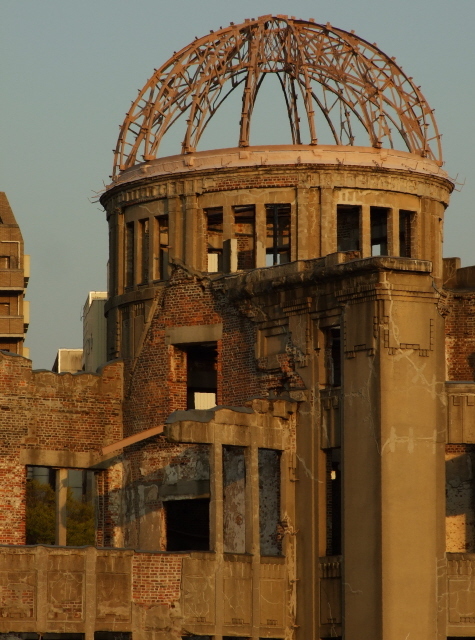 In a way it's almost an irony that the one building that suffered the least damage should become such a symbol for the otherwise nearly total destruction of the city – most of Hiroshima's buildings were made from wood and were completely incinerated by the bomb. 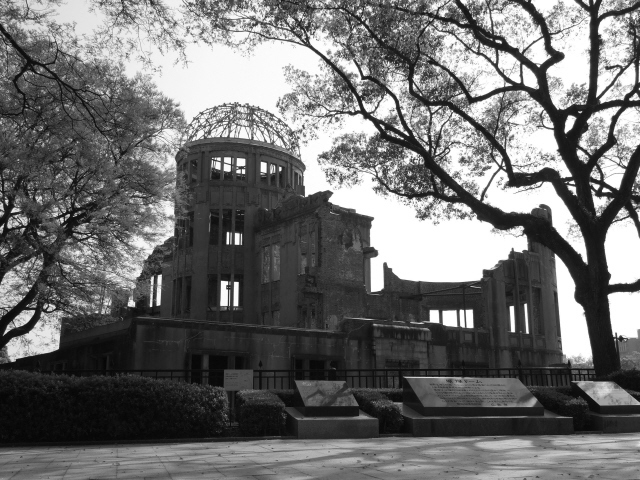 Early photos of the destroyed city showed only the A-Bomb Dome as the sole recognizable structure in the charred and flattened wasteland around. There were a few other comparatively modern, solidly constructed (earthquake-proof) concrete buildings in the city that weren't completely flattened either (see Hiroshima). But those few other ruins whose shells remained standing lacked the architectural merit of the A-Bomb Dome and/or didn't have a similarly favourable location. 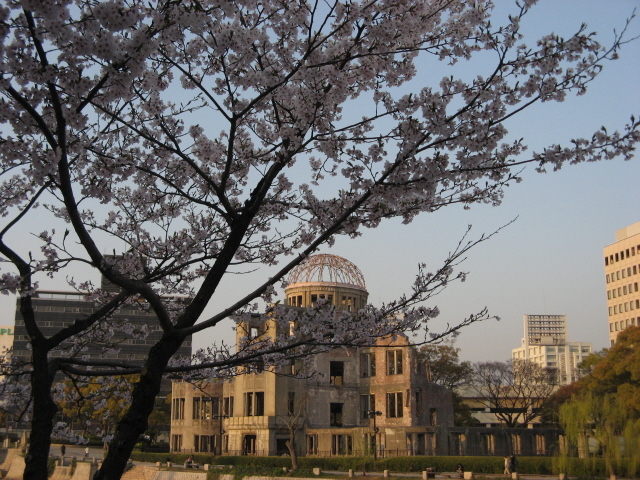 So the A-Bomb Dome became the focal point of what was turned into the Peace Memorial Park. 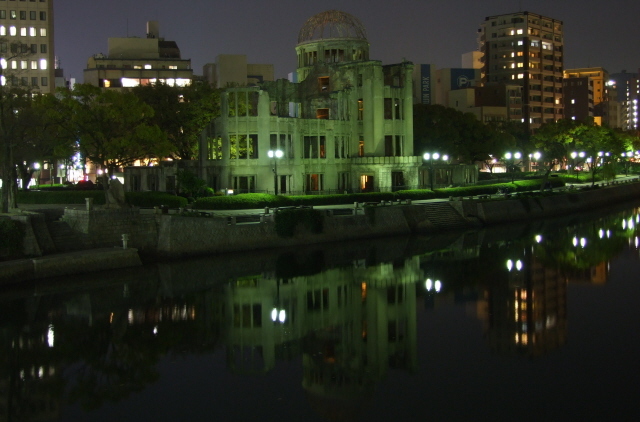 The Park's central avenue is aligned with the A-Bomb Dome, so that you can see all the way from the Fountain of Prayer outside the other side of the Peace Memorial Museum, through the columns that the museum's central building is resting on, past the central Cenotaph, the Flame of Peace in the Pond of Peace and across the river to the Dome. 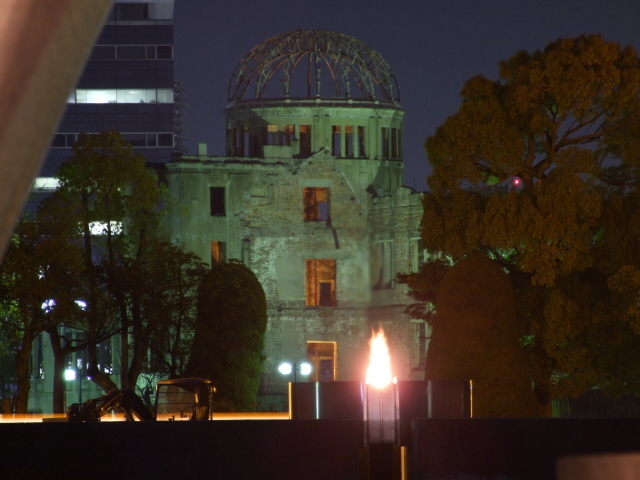 The immediate recognizability and symbolic power of the A-Bomb Dome also made it almost inevitable that its shape had to feature in this website's logo. What there is to see: Mainly just the empty shell of the former Hiroshima Prefectural Industrial Promotion Hall, or rather just the front facade of it with the central tower being the most complete part. Only wall fragments of the lowest floors of the rest of building are partly still in place too. Beyond the Dome, modern Hiroshima today provides a backdrop of rather faceless contemporary buildings that detract a little from its impact, until you get quite close. The ruins themselves are not accessible – they're surrounded by a fence (and signs warn of alarms should anyone go trespassing). But you do get a good look in from the outside. 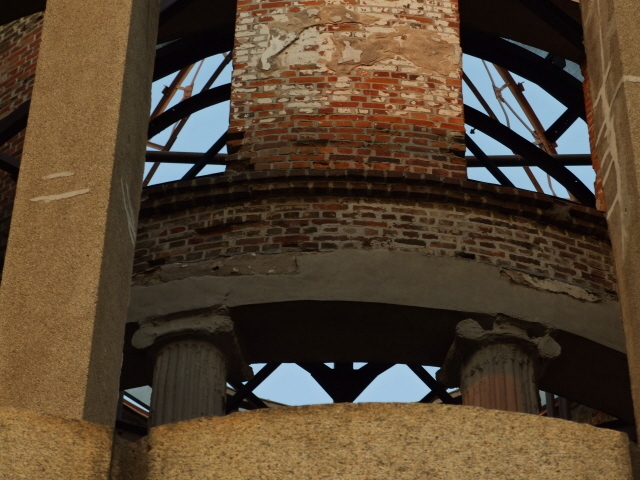 Not that there is much inside to see other than a twisted metal spiral staircase and the remains of decorative columns in the former staircase. 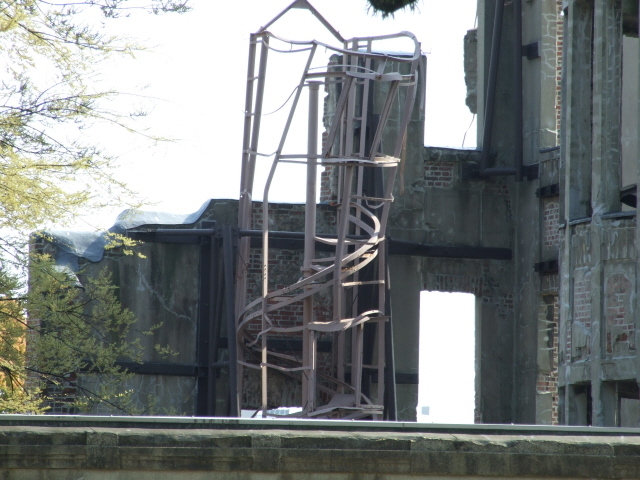 Otherwise, there are only the steel frames put in place to support the structure during the restoration and preservation work of the 1960s and 90s. Around the ruins, there are several text plaques (also in English) and additional memorials, including one to the old Aioi Bridge just north of the Dome – and the Peace Memorial Park extends across the other side of the river. In a backstreet behind the Dome, a small memorial stone with a brief text plaque and a photo taken soon after the bombing marks the spot of the hypocentre. All around the A-Bomb Dome tall trees soften the atmosphere – esp. at cherry-blossom time, when some of the trees turn an almost surreal pink, contrasting sharply with the otherwise grim aura of the place. 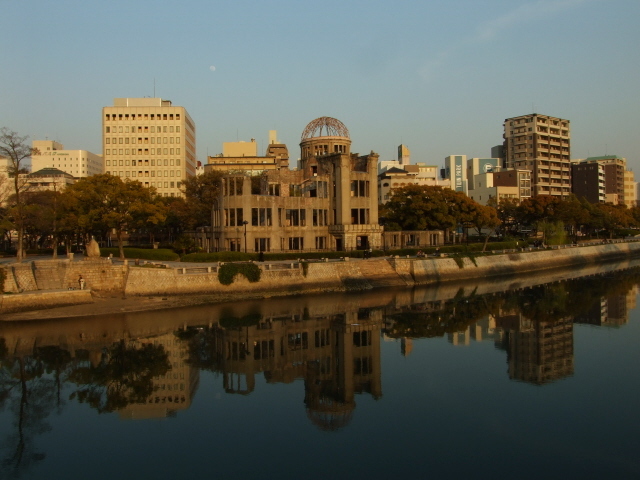 Location: right in the centre of Hiroshima, to the north of the Peace Memorial Park, just across the new Aioi Bridge, set back slightly from Aioi-dori, on the riverbank. Access and costs: easy to find, free. Details: from Hiroshima station it's a ca. 20 minutes' walk, first south past the huge department store, across the river, then at Inari machi turn right and walk all the way down Aioi-dori. Or you can take a tram bound for Eba or Miyajima-guchi and get off at the dedicated stop Genbaku-Domu mae just outside the A-Bomb Dome. From the Peace Memorial Park it's totally unmissable, as it forms the focal point of the whole complex. Access to the outside of the Dome is free at all times – the area inside the fence is off limits and alarmed. Time required: a quick look won't take more than a few minutes – however, the eerie attraction of the structure can make you want to linger and even come back at different times to see it in changing light. For photography, evenings are much better than the midday glare on sunny days. From the rear of the building you can watch the sun set directly behind the iconic ruins – and at night the Dome is subtly lit, and thus makes an irresistible target for photo shooting in yet another, and most peaceful, atmospheric light … esp. from across the river (or the middle of Aioi Bridge) when the reflection of the Dome in the river's water provides a perfect mirror image. Combinations with other dark destinations: see Hiroshima – nearby but a bit hidden in a backstreet behind the Dome, the small memorial marking the hypocentre of the A-bomb explosion can be found.You have to actively look for it, it's easy to miss (which would be impossible in Nagasaki, by the way). It's one block in from the A-Bomb Dome outside the re-built Shima hospital (the original was completely destroyed in the blast), on ootemachi 1-5-25, Naha-Ku. 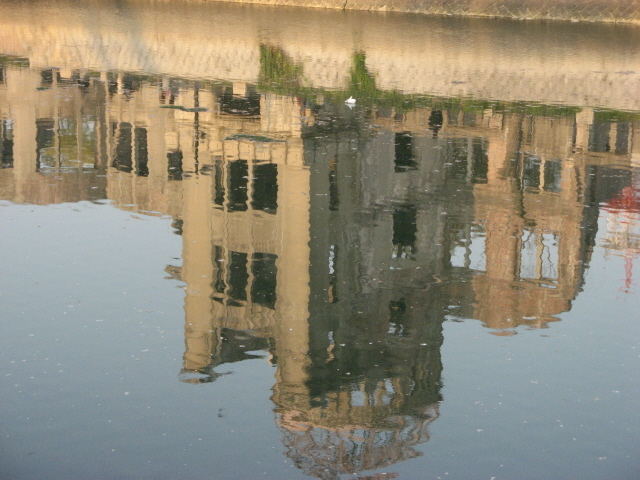 See also the photo in the gallery for Hiroshima in general. 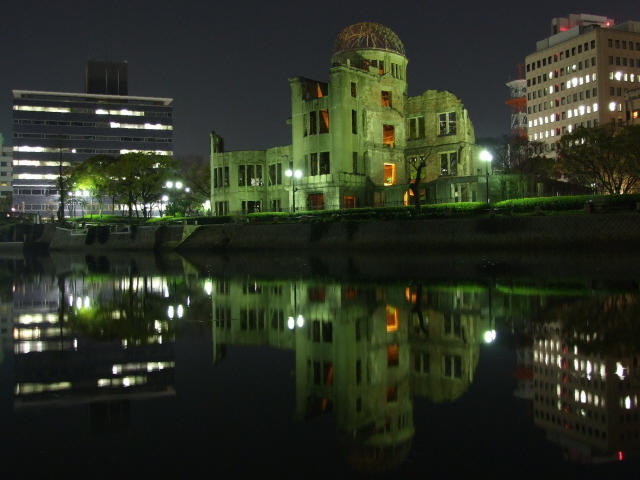 Combinations with non-dark destinations: see Hiroshima.